Woodcraft - i think ??? I’m sure the boo-birds will come out and say this shouldn’t be here or it isn’t fair, blah, blah but WTH? I was looking at what’s new and had pages of stone yard decorations and exercise equipment? I dislike when companies forget who their customers are. Rant over, let the annihilation commence. Right—you have an interesting forum post that’s not a review—you already figured that out, but posted it anyway. Why not post it in a forum? Same with Lee Valley, where I get seasonal catalogs full of gardening and culinary gizmos. Maybe build a mobile base from wood and it’ll justify it being there…? I don’t know. Make wooden handle covers for the Elliptical for that oh-so-fresh wood smell instead of sweaty palms? It is odd, I’ll give you that. I walk out of Lee Valley empty-handed sometimes, because they’re out of stock of the items they built their reputation on. I CAN get a gardener’s hat with built-in parasol, however…. Lee Valley is such a strange mix of great items and total crap gimmicky type stuff. It’s always strange to see their planes advertised on the same page as magnetic armbands to hold screws. Hardware stores and businesses have to try different things to survive and prosper. Where I grew up there was a retail hardware that had the oddest assortment of stuff. Some of it you just shook your head at, but somewhere among their customers was a buyer. They were founded in 1876 and are still in business. Since I imagine business has changed in the 100 or so years, it’s astonishing they are still in business, but despite their quirky stock, I still enjoyed going there for things. Don’t worry, if you hold your nose up high enough you won’t be able to see anything that sully’s your view. Of course, you may miss the occasional exposure to neat, new and interesting things hiding amongst the offending idea but new and different might be harmful to your health. You should consult a professional before exposing yourself in that manner. I will agree it’s odd that they are selling exercise and gardening equipment but really, no odder then posting a rant in the clearly labeled reviews section of Lumber Jocks. I remember years ago we were on vacation in Ohio and visited the Amish Country. Found this little what I called a Hardware store that carried all sorts of items, but none of it electric. I loved that store. They had items I remember as a kid. So there is a buyer for everything at least once. 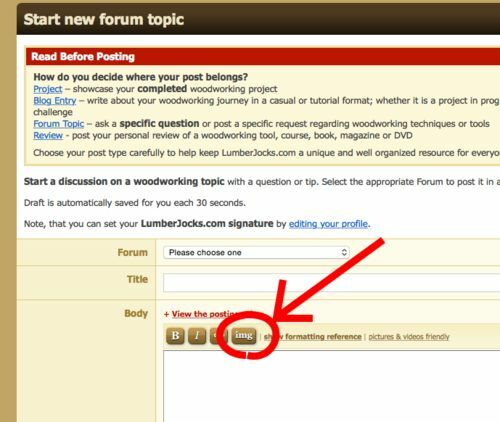 I’d just like to point out that it’s really easy to add images to forum topics (and any other kind of post). There’s an “img” button in the toolbar when you add/edit a post, you just click on it and then select your image and upload. Don’t worry, if you hold your nose up high enough you won’t be able to see anything that sullys your view. That’s tagline worthy, right there. schuft- thank you, I knew I had seen that somewhere and was just overlooking it but couldn’t nail it down when I wanted to, the upload on reviews is right up there. I appreciate it. Neat, new and interesting things hiding amongst the offerings is the very reason I was looking in the what’s new category to begin with. I just thought it poor marketing. Have any of you ever needed a can of finish or specialty hinge and instead bought an elliptical bike? Of course if I needed a piece of exercise equipment I’m sure Woodcraft.com would be one of the first places I would go to peruse the options. Half-A borrowing , Noses up high is what it seems like from here with all the posting police. I throw myself to the mercy of the mob. I read a lot of stuff on this site that is great and some that isn’t but short of spam or self promotion I don’t see any problem with a piece of writing about the quality of… being in the review section. I did look in forums to try and see where it would fit, this seemed the best, had a bit of discussion, all is well. Thanks to all for the comparative notes on experiences. Let us build stuff people. I will agree it s odd that they are selling exercise and gardening equipment but really, no odder then posting a rant in the clearly labeled reviews section of Lumber Jocks. Have you ever heard of diversifying your company. They are probably seeing opportunities in other markets and instead of setting up a whole new company and website they are testing the waters. What is the big deal if they sell other things as long as they have what your looking for. They didn’t forget who there customers are, they know there customers also buy these other products.